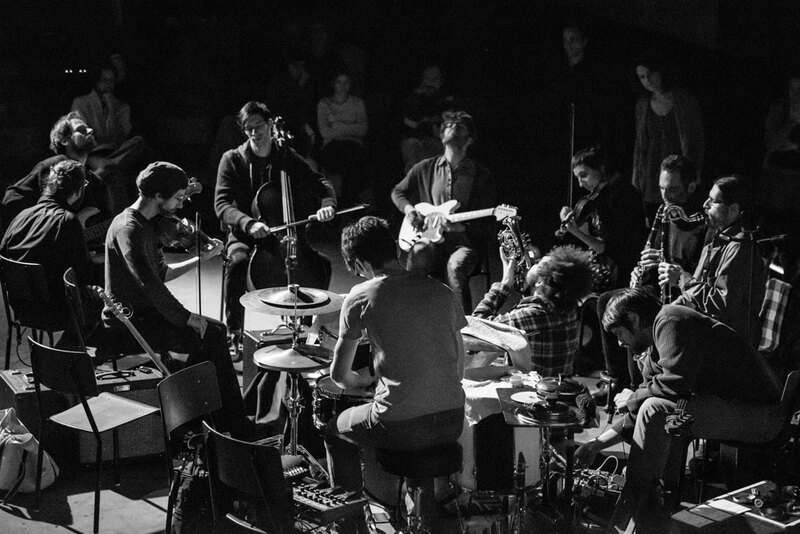 GGRIL is a large group of improvisers from a small town in eastern Quebec who bring together a colorful and electric instrumentation, a playful and raw dive into liberated territory. GGRIL has been active since 2007 and, in addition to developing a personal repertoire, has worked with musicians of the calibre of Jean Derome, Evan Parker (Uk), Michael Ficher (Au), and Ingrid Laubrock (Usa). 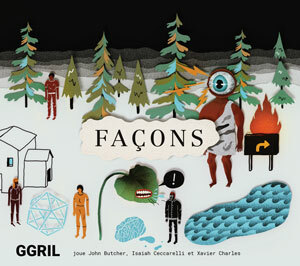 Façons brings together monolithic and obstinate music created during residencies with John Butcher, Isaiah Ceccarelli and Xavier Charles. Organon was commissioned from Isaiah Ceccarelli in 2016 and premiered in Rimouski on May 1 of the same year. It is a series of monolithic agreements. We must imagine the sound of a great organ, an orchestra of 500 viols playing in unison, a hurdy-gurdy, several bells ringing at the same time, rattles, a crackling sound, a forest fire. On Your Knees was inspired by a workshop done with Xavier Charles in 2015. The piece is a listening exercise that is now part of the GGRIL’s concert repertoire. Local Fixations was commissioned from John Butcher and premiered with him in April 2018 in Rimouski. Interested in the contrasts of timbres and manners, this piece is the one that leaves the most room for improvisation. Le GGRIL est un grand ensemble d’improvisateurs venu d’une petite ville de l’est du Québec et réunissant une instrumentation bigarrée et électrique, une plongée ludique et crue en territoire libéré. Le GGRIL est actif depuis 2007 et, en plus de développer un répertoire personnel, a travaillé avec des musiciens de la trempe de Jean Derome, Evan Parker (Uk), Michael Ficher (Au), et Ingrid Laubrock (Usa). Façons réunit des musiques monolithiques et obstinées créées lors de résidences avec John Butcher, Isaiah Ceccarelli et Xavier Charles. Local Fixations composed by John Butcher. Recorded by Antoine Létourneau-Berger at Coop Paradis, Rimouski, April 22nd 2018. Edit and mix : Robin Servant and Éric Normand, John Butcher.